mags11 has completed the grueling 26.2 ATR miles to full recovery! Exactly 120 days from surgery I made the trek down to Bandon Dunes on a guys golf vacation. There aren’t any motorized carts allowed, which I knew, but wasn’t going to miss this trip. Didn’t really need to ice or elevate and ibuprofen helped. I’m a little sore since I’ve gotten home, but it was well worth it. 60 degrees, sunny and minimal wind…i would have been upset to miss that! It has been awhile since I’ve posted an update for two reasons - having a newborn around the house and after week 8 or 9 the updates aren’t as “groundbreaking” anymore! I’ll start out with the obligatory, I can’t believe I’m at week 14 already. I really can’t. It seems like yesterday that I was looking at that NY marathon map and wondering when I’d be over that first bridge. I’ve been doing a ton of exercises. Not so much directly with the calf (although two leg calf raises and seated calf raises with weights I still do), but mainly more overall lower body strengthening. Lots of band work (monster walks, side to side walking, etc…), single leg balance and squats on foam/bosu/balance ball, squats and leg press machine. I can really tell when I skip a few days as my leg doesn’t feel as good. As for cardio, I’ve been walking on treadmill, elliptical and stationary/recumbent biking. I’ve started golfing regularly. Through week 11 I was golfing in my boot and using a cart. Since week 12, I’ve been walking 18 holes once or twice a week and carrying my bag (pretty hilly course so it is a workout). I’d be lying if I said I felt great (although each time is better), but a little ice and ibuprofen and I’m back to normal pretty quickly. I’m playing 4+ rounds of golf over a long weekend in 3 weeks at Bandon Dunes so getting my conditioning up is critical (carts aren’t allowed so all walking!). That will be 17 weeks from surgery. I’m kind of in a holding pattern for increasing exercise until after the golf trip. We don’t want to introduce a bunch of new advanced exercises and potentially risk a setback. I ditched the boot for good 2 weeks ago. I was wearing it for certain things still (UW husky football games), but this Saturday will be my first one without it. •	Out of PWB stage quickly – I think I was FWB at 2 weeks (in boot of course). Who knows if that all helped…maybe it is just luck? Best of luck to all you out there! Week 8 update - two shoes! I had my OS appointment yesterday, a day before my 8 week anniversary and was given the green light to transition to 2 shoes. I’ve spent the majority of the time since in 2 shoes and only put the boot on when I was going to my son’s school curriculum night (was a little leery of a large crowd on my first day of two shoes…). I had been walking in bare feet for a week or so but it feels much better to be in shoes. The leg feels a little weak and I’m doing the typical transition slowness but I’ll take it. I had a ton of swelling last night (had like a muffin top when I took my shoe off), but so far today the swelling hasn’t been bad. I imagine I’ll still use my boot when I go to UW Husky football games and possibly when I golf over the next week or two, but I think I’m mostly done with it! I’m going to continue with once a week PT (tomorrow I believe we are going to start on the leg press machine) as well as my three times a day work out of squats, one leg balances, seated/standing calf raises and band work. I slowed down on the gelatin supplementing as I got tired of Jello. I don’t mind the taste and texture, I just would forget to take it or make it. I’ve stuck religiously to my protein supplements (twice a day) and vitamin C supplements (once or twice daily packets of emergen-c). I don’t know if they are helping, my gut tells me they are but who knows. One last thing. I noticed a bump on the bottom of my foot. It is about the size of a pea and it is on the arch right below the ball of the foot. It doesn’t hurt unless I press on it (to which my wife says don’t press on it). I only discovered it because I was rubbing my foot to help with the swelling. The PT doesn’t think it is anything major and we are going to track it. Did anyone else have anything like that? week 7 updates - new firsts! Well week 7 had a lot of new firsts. Started driving again over the weekend. It is nice to have that freedom back. My goal was to be driving by 8 weeks so that I could take my wife to the hospital when the baby comes (due date a week away!). Sleeping with my boot off which is soooo nice. Walked in two shoes around the house and outside, although I’m going to stick with the boot until I meet my os later this week. Standing calf raises…they feel much better then seated calf raises! Another interesting first was that my bad leg could do plantar flexion and dorsiflexion to just about the same point as my good leg. I’m not sure if that is good or not, but figured I would note it in case I have any issues of healing long or something like that. My pt gave me a couple new exercises. One is as to squat down and then oscillate up and down an inch or two for 10 seconds. That really hits the quads and loosens up the ankle. The other is standing calf raises. I have had a slight increase in heel pain which I’m attributing to the increased activity (in addition to the new stuff, I walked a ton over the weekend at a husky football game). It seems to go away with rest and ice so I’m not really concerned. Good luck to everyone out there! This site has been great and it is nice to read about everyone’s progress and the different approaches to this injury. I figured I’d post a quick update for the golfers out there who are early in their recovery. Yesterday I played 18 holes in a scramble and then played 7 more holes tonight. The boot is on when I’m playing and ball is going about 20% less but straight (probably due to my lack of weight shift and getting on my toe). I’ll take that even when I’m healthy! I played the 7 holes 3 over and I’m a 13 index. So the boot might stay on for rounds even when I’m healthy! It is interesting that I find writing blog entries very therapeutic. So I apologize if I’m writing too many! I’m also doing band exercises - 4 sets of 10 once or twice a day. PT also still includes a massage with a graston tool which was less painful this last time. I started with my new PT on 8/20, exactly 5 weeks from surgery. There is a night and day difference between the PTs and even their offices. Glad I made the switch so far! In this session I had my first expereince with a graston tool. That felt good for the most part with a little bit of pain and discomfort. I also was given a band to workout with each day - 4 sets of 10 reps where I point my toe and slowly bring it back to neutral. I also walked for my first time in bare feet. I took two small steps. Talk about a humbling experience and a good reminder that this is a long process. I was feeling pretty good in my boot and geting around well and not even really thinking about my injury, but trying to walk on bare feet made me feel like I was back at square 1! Things are progressing. Fwb in a boot is great, it took about 3 days to get a good gait and since then it hasn’t really felt like it hinders me much. I haven’t been to pt in about 9 days. I was worried about the stretching my pt was doing and healing long. I decided to hold off on pt until I saw the surgeon last Thursday. He gave me a clean bill of health and shook his head when I told him that the pt stretched me past neutral. He said you don’t want to be doing that at this stage. I start with a new pt tomorrow so hopefully the experience is better. It is funny I was so concerned and protective of not slipping, falling, tripping, etc… And then when all the healing long talk started my new fear started! Well it is what it is at this point so nosense worrying I guess. I started hitting balls at the range with short flat footed swings in the boot. I decided I was finally going to change my grip so I figured there was never going to be a more perfect time. It feels good to be swinging a club again. Not much to report, but i had a minor victory over the weekend. As I was putting on pants I stood up on one leg as I normally do. I had been sitting with both feet on the ground with my bad foot at about 90 degrees. It’s funny how such minor things can feel like such big deals nowadays! Tomorrow will be the 3 week mark for me. Things seem to be going well, boot walking is getting easier. Incision is healing well and was told I could go into a pool. I had my 4th pt appointment today. I’m a little concerned that the pt was overly aggressive with the dorsiflexion today. I mentioned that I wasn’t supposed to go past neutral and she got me to 5 degrees. It is the first time it has been stretched past neutral. There was also a super sharp pain with burning while she was massaging my incision. Not related to stretching and everything was fine after a few minutes so I’m hoping it was scar tissue or something. This sounds great! I’m 6 days post op and hoping to take a trip to Greece with lots of walking by week 17. Also hoping to return to golf as soon as possible. Sounds like I have a good chance based on your experience. Good stuff, must have felt good all over! Sounds like you’re doing fine. But health professionals dispense more nice-to-hear BS than drugs or exercise! All surgical patients started out way worse than average, and ended up way better. You can see it in the comments reported here, and it makes sense, too. Thanks Mags11 - still deciding whether to gingerly PWB at 2 and a half weeks but my foot feels fine if I do put weight on it. Maybe I’ll just go for it, slowly. I hope you continue to recover weel. Sounds good and sensible. I’ve got nothing on the pea bump. Great news! 2 shoes is definitely an accomplishment. Good idea to keep the boot handy for larger crowds. After walking quite a bit I have swelling too, but it’s getting better over time and I’m seeing that my foot doesn’t swell as much anymore so I’m hopeful that too will go away in time. I too take gelatin, but I use Great Lakes powdered gelatin (got through Amazon) and I just add it to my protein shake in the morning. As for the bump on the bottom of your foot, can’t say I have that at all and so can’t be of any help. It may be nothing but if you’re not sure it is probably something to ask your dr about. I continue to be amazed with your progress! Way to go! And congratulations on the upcoming baby! Impressive! I haven’t checked my fave protocols, but 2-leg heel raises at 7 weeks MUST be faster than ANY of them, no? I am not a golfer but that is quite impressive at the 7 week mark. Congratulations! Keep it up. It is great to read your progress and it sounds like you are doing so well. PT makes such a difference and gives goals that you can work towards. 2 shoes in two weeks- yahoo! Love reading about your progress. I can’t believe how fast you are moving but obviously it is the right pace for you. Keep it up! Just something I noticed when I did the weight shifting, I would still force my weight on my good foot. I got over this by lifting my right foot to make sure weight went on my left foot. I think I will do some of the things you’ve mentioned. Just come out of boot at week twelve but no physio til next week. Wish I’d started bit of bare feet walking sooner , it is so different, as you said. Good luck and keep us posted with how you get on. These seemingly small steps are massive to us in the ATR club. Congrats. Good luck with the rest of recovery. Thanks for your post mags11. in two days will mark my 3rd week post op and although i’m still in a cast its good to know how much progress can be right around the corner. best of luck. I find the two terms confusing myself, which is why I’m glad my doctor told me that I could do unassisted stretching with my foot right now. Now that, I could totally understand correctly! Thanks Chris for the correction - you are right. Not sure where my head was with that passive and active. With my current tendon injury (bicep) my doc wanted only passive so I get a bit confused. I think it is important to be correct with terms or other people can get confused as well. Cheers. Mags, yes you are right about stretching while walking. I think you just need a little DF to be able to walk anyway. The point is that having the PT perform stretching execises with the goal to reach max df as soon as possible is probably counter productive. Walking in 2 shoes from week 8ish probably adds just about the right amount of stretch for that period. And to be honest the tendon seems to stretch out by itself from just walking. This is obviously just my personal observation but I’ve read about similar experiences on this blog. I don’t really push hard on stretching but I do the knee to wall test every day just to make sure I don’t go backwards in rom. Also, this is about semantics but passive stretching is when you apply external force on the joint and active stretching is when you have the joint move with your own muscles connected to that joint. It’s the passive stetching that you should be really careful with. Active stretching is probably not harmful at all if done with moderation even early on. Again, this is just my own thoughts and after all im just regular Atr guy on this site. Mags - I concur. I don’t feel at 3 weeks you should be actively stretching the hell out of this. You should only be doing passive stretching (i.e. no external force). If this is how your PT wants to work now then how will it be later. My first PT set my boot wrong and ignored the docs orders. Found another and it was put right but there was a couple of weeks in between. I was NWB at the time and all seems to have healed fine. She was concerned about healing long and had attended a conference recently with some world leading expert talking about that very thing. Your tendon should be knitted with type III collagen by now so as long as you do not continue this all should be OK.
@chrislondon - that is an interesting approach. I’ve heard of the “not past neutral” until 6 to 8 weeks but not out to 12 weeks. It seems that if one were to go to two shoes before week 12 in that scenario, they would be actively stretching it past neutral (or walking would be almost impossible). I’m not an expert by any stretch, I’m just trying to picture walking with shoes without going past neutral. I do agree that PTs want to get to normal quickly, that was the vibe I got from mine which is why I’m looking to change. My OS told both me and my PT to absolutely not to stretch the tendon before week 12 just to make sure it doesn’t heal long. He also said he had never seen a patient whos tendon didn’t end up in correct length despite waiting 12 weeks with passive stretching. I followed this advice and now at week 18 I almost have full DF rom (6 weeks of stretching). At week 12 i could barely get past neutral (knee 13 cm from wall at the knee to wall test, now I’m at -10 cm with toe). I don’t see any point in rushing the stretching because it would only increase the risk of healing long. It WILL return to full ROM in time if you had a normal repair. If you went non op you will probably have to be even more careful. My OS also told me that the problem with PT’s is that they want everything to go back to normal as quickly as possible (ROM, strength etc) but few are aware of the risks with healing long. Yes, Chris. Doing too much of ANYTHING during rehab is a bad thing — that’s why they call it TOO much!! Quite a few ATR patients, op and non-op, end up Healing (too) Long, and the simplest assumption is that it comes from over-stretching while the tendon is weak and “impressionable” — either stretching intentionally, or slipping and falling and stretching it that way. Healing long is a major cause of dissatisfaction, because it causes weakness and asymmetry. Most of the most successful rehab protocols — UWO is the one I’m most familiar with, bit.ly/UWOProtocol — wait quite a few weeks before allowing their patients to dorsiflex past neutral, and then only “actively” (using your internal leg muscles) for another few weeks. Norm, you mea doing too much dorsi is a bad thing? How else do you get it to go up beside painful stretching. Increased ROM (DF) can certainly indicate a longer AT. It can also come from busted adhesions. It is sad but true that some PTs do harm by prescribing too much, too soon. 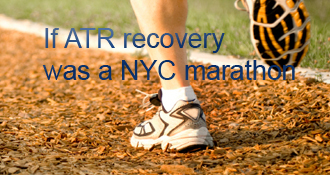 Mine gave me a painful 1-month setback after my ATR #1, as I outline on my blog. @Mags — A nice sharp burning with no long lasting pain sounds consistent with scar tissue popping off in my experience, so I wouldn’t be too worried. But good call on finding a new PT if the current one makes you nervous. You want that relationship to be one of trust (and competence), particularly once you start getting into more aggressive rehabilitation. As for healing long, one thing to be potentially be wary of: when I was planning my own recovery protocol I did a lot of research on here and observed that people who incorporated early swimming self-reported healing long with a higher incidence than those who didn’t use the pool. Well, I didn’t start pt till about week 4 and 3 days when I had the boot, but from what I know as long as the achilles tendon is healed a little aggressive stretching will not hurt I know everyone is different, but the stretching beyond neutral hurt like nobodies business, but the benefit was the next day I had better rom. At this time I can walk on my foot with one crutch, and when I have two I can imitate foot movements better thanks to more dorsiflexion movement. But you know your body best. A full length squishy-gel footbed should help, no harm, provided it doesn’t change your ankle angle (I.e. keep the heel wedge) or your 2-foot balance (add one to your other shoe too?). Many of us had this problem in 2 shoes. I wore Crocs. Easier than carpeting the house with gel! Yeah it is definitely the bottom. I don’t feel much if anything through my through my Achilles or calf muscle. I’m pretty sure it is from the transition from nwb to pwb to fwb (about a week for that) as that is when it popped up. The heel wedge I have in looks rather uncomfortable and not squishy… I’ll have to check on a different insole. Mags, can you confirm that the part of your heel that gets sore is the bottom, and not the back? The former pain is almost universal when we return from NWB immobilization, and usually resolves on its own or with the help of squishy insoles, etc. ; the latter one calls for backing off and going slower, IMO. Hi markk, I ditched the crutches and have been fwb in a boot since day 14. My calf hasn’t been sore, but my heel gets tired/sore after a little while. I’ve been walking a mile or two in my boot and have been doing the exercise bike for about 20 minutes (with a target of 70 rpm), so that is probably why my heel gets sore. It was tough mentally to go from pwb to fwb. But my doc wanted me off them so I just did it…i think I needed to hear that from him to get over the edge. Hi mags. I am just a bit behind you time wise it think. Three weeks post op and in a boot. I am on crutches but no way I can put weight on my foot. Swollen and very sore in my upper calf. Are you walking now? Thanks for the info all! And David, if I don’t have any proof I’ll be happy with that! Wow! I am impressed both with your progress and your quick healing! I think you are one for the record books! You are very lucky. That scar already looks way better than mine was at that same time. Kelocote was recommended to me to use to help with the scar. I only started using it now and I’m at 6 weeks so I can’t tell you how well it’s working, but I know others that used it on their surgical scars with great success. Keep up the great healing! That looks great for just two weeks after surgery! My foot surgeon recommended Lubriderm lotion. At about 4 weeks, you can start massaging vitamin E drops onto the incision. Good luck! I went op and had my stiches removed at day 6. I’m on both feet down now - ditched the crutches last night as my doc recommended. I bought the even up for my good foot and am working on getting a better gait. Feels great to be off my crutches. Wow! That’s fast. Did you get your stitches out already? Or did you go non-op? Are you walking with both feet down and crutches? Mags - my PT gave me the ProCare Ankle Brace. Seemed to work pretty well. Hope you can make your Bandon trip! Yeah good to know about Bandon. I’ve only walked it and didn’t realize they have doctor exemptions for carts. I’ll have to check on that. My doc, who has played it, says I would be pretty tired at the end of the day, even if we only did one round. Do you recall what brace you used at week 11? mags11’s AchillesBlog is proudly powered by WordPress and WPDesigner..